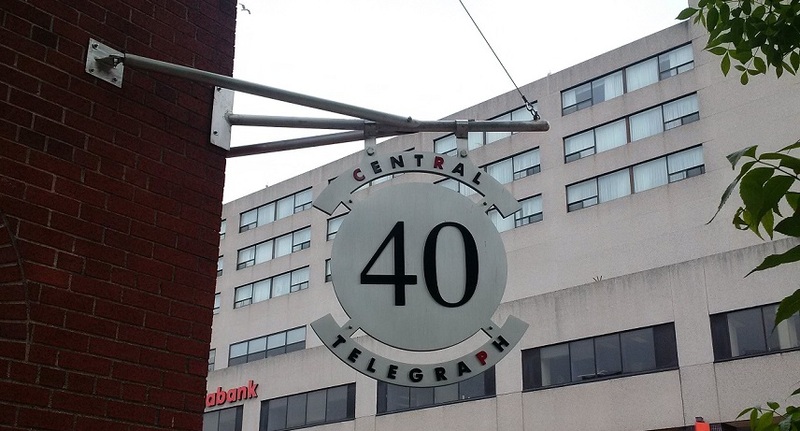 Have you noticed this sign at 40 King Street, Saint John and wondered what “Central Telegraph” means? The owner of this building put a lot of thought and resources in to the design and procurement of a class A sign for his building. Q. What’s the story behind the sign? A. The building was the site of Canadian Pacific Railroad’s telegraph office. In the old days if one wanted to send a message anywhere in world they would go to this telegraph office to do that. I wanted to have a smart looking address displayed on the building and after reviewing some old pictures (see gallery of old photos below) and the history of the building, I designed the sign concept. I also wanted the sign to be more that just an address identifier – to add something to the historical content of the area. Q. Did you have to get approval from heritage and was that difficult to obtain? A. Yes, did have to get approval. No, it wasn’t too difficult as we had a good layout drawing and a good historical case (see pics again) for a sign protruding at a 45 degree angle from the building corner. A. The sign was made by Design Art Signs (Rick Waters) but the actual fabrication of the circular part was done by a manufacturer in Ontario. Q. Approx how much did it cost to make? A. $10,000 (The owner obviously puts a tremendous value on signage in order to invest such a handsome some. Keep in mind though that creative/quality signs come in a variety of styles, materials and price points). Q. Where did you get the hanging bracket? A. Design Art Signs fabricated the hanging bracket locally. We worked together on the bracket layout/design as I also wanted to give the sign a nautical feel – again historical to Saint John. Commercial property signage is a critical component of a business’ overall marketing strategy. Just like your personal appearance, your signage must be well maintained and updated from time to time to be effective. Be vigilant and consistent in evaluating the condition of your commercial property’s signage to ensure that its effectiveness & style are bang on. Read more about the importance of good signage HERE. Photo of the building readied with bunting for the royal visit of King George VI and Queen Elizabeth. By Stephanie in Commercial Real Estate, Heritage, Partners Global, Saint John on June 24, 2015 .